In the salad days of Nevada’s Comstock Lode a great social institution was spawned by mining magnates, artists and men of letters who sought to hobnob in luxury. The Washoe Club gained a reputation throughout the Pacific Coast for luxurious accommodations, and at one time it was a household term. Soon after Bonanza dividends surged from $3 per share in January 1875 to $10 per share within less than two months, an organizational meeting of the Club held on February 20 proved to be a prelude to a parade of notables that would cavort through the Club’s exclusive quarters which housed one of the finest libraries east of San Francisco, an elegant billiard room, a parlor adorned with Italian marble and bronze statuettes, and a wine room that boasted an elaborately carved black walnut sideboard. The Club’s membership roster read like a Who’s Who of Comstock and Pacific Coast history, and the pages of the Club’s guest register were emblazoned with the signatures of General Ulysses S. Grant, General Robert Sherman, actor-lecturer Artemus Ward, actor Edwin Booth and railroad magnate Darius Ogden Mills and fifty other millionaires of international reputation. …a meeting was held yesterday afternoon at 3 o’clock at the office of Whitman & Wood in the California Building, for the purpose of taking steps for the organization of a social club in this city. The club begins with sixty charter members, who pay in $150 each, making $9,000 with which to start. The initiation for new members has not yet been decided upon nor the amount to be paid in per month by each member. We understand that the club will either purchase or erect a suitable building in which to fit up their rooms, and it is their intention to have everything in grand style. There will be a fine library and all the leading newspapers of the United States will be kept; also, the stock reports and all also in the way of news will be brought to the rooms of the club. There will be a billiard-room, lunch room and all else that is to be found in the rooms of any first-class club of the kind. The number of members is limited to 200. This club will supply a want long felt in the city, and is calculated to do a vast amount of good in a great variety of ways. The names of those who are taking the lead in organization of the club are a sufficient guaranty that it will prove a grand success in every respect. Among the sixty charter members were Bank of California officers W.H. Blauvelt, J.E. Eckley, J.P. Martin and A.J. Ralston; Nevada Bank of San Francisco agent George A. King, Territorial Enterprise editor R. M. Daggett, mining magnates John Mackay and James G. Fair, Tahoe lumber magnate D.L. Bliss, mine superintendents Samuel T. Curtis, Charles Forman, W.S. Hobert, Frank F. Osbiston, and Isaac L. Requa; former Nevada Chief Justice James F. Lewis, Judge R.S. Mesick, Virginia and Truckee Railroad officers F.A. Tritle and H. M. Yerington and Wells Fargo agent C.C. Pendergast. P.F. Beardsley, C.H.Belknap, Daniel Cook, A. Cornwall, George H. Dana, W.E.F. Deal, C. Derby, R.V. Dey, Samuel Doake, E.D. Dorsey, C.E. DeLong, Dennis Driscoll, A.M. Eddington, G.F. Ford, N.C. Hall, A.C. Hamilton, John B. Hereford, G.W. Hopkins, R.P. Geating, Robert H. Lindsay, John Mallon, Joseph B. Mallon, D.C. McKay, T.D. Parkinson, T.H. Ralston, W.M. Robertson, Henry Rolfe, George Senf, M.N. Stone, Thomas B. Taylor, A.B. Thompson, C.W. Tozer, John Van DeWater, C.H. Van Gorder, R. Webber, B.C. Whitman, W.S. Wood, William Woodburn and W.T. Wright. The double hall was at once taken out and the stairs, which were in front, were removed to the rear. As at present arranged, the ascent is easily made and the hall commodious. The lower floor of the building is still occupied by Mr. Thompson, the architect, upon one side, and by Mr. Hereford, the mill and mining superintendent, upon the other. To the north of the hall, and next to the eastern wall, is the wine-room — 14×17 feet – which will be fitted up with an elegant sideboard, etc. Between this and the front parlor is the card-room –14×14 — which is to be elegantly furnished, but in which no games for money will be allowed to be played. Passing through the folding doors to the front, you enter one of the double parlors, which occupy the whole front of the building, and are connected by sliding doors of ample dimensions. The first parlor is 19×24, the second 24×27 feet. To the west of the one last mentioned is the billiard-room, 24×31 feet, which is to contain two tables, of elegant pattern and most approved make. Either of these rooms is accessible from the hall and communicate by means of sliding doors. The old windows are to be removed and replaced by two pane of French plate glass. The carpets and furniture are to be of the most elegant styles and make and of superior quality. The grates and mantles are of the purest marble, and when completed, the Washoe Club will have a place where they may recline at ease and sojourn in comfort. It is the intention of the Club to erect a building upon the western portion of their lot, and facing “A” Street, which will be fitted up in elegance and used as a really first-class lodging house with restaurant attached. When completed, the Club may justly feel proud of their conveniently arranged, elegantly fitted up and comfortable rooms. . . .The situation is most desirable, being on “B” Street, between Taylor and Union, and a few doors north of the Court House. The front is adorned with a balcony, from which the magnificent scenery to the east of the city is visible. This outlook is unsurpassed by any in the land. The eye ranges over the busy part of the city, the hills to the east, the Sugarloaf, the Valley of the Carson, the Como Range, and on till its reach is lost in the distance. Upon the background of the picture, the Twenty-six mile Desert, 65 miles away, appears as a brown spot, and the Humboldts, 150 miles distant, raise their bold broad brows, snow-covered, till they seem to mix with heaven’s blue arch and fade away to the sky. The faint outline of the Forty-mile Desert, so terrible in early days as the abode of dusty death, is just caught as it sinks, like the dip of ocean water, behind the intervening ranges. The approaches to the rooms are easy and elegant. The lower hall is ample and well lighted. Toward the western and the stairway rises very gradually, taking 32 steps to gain the elevation of the second story. The hall above is also ample, well lighted, and affords easy access to each of the rooms. The stairs and upper hall are elegantly carpeted with body Brussels. The front part of the second story is occupied by the parlor and reading-room. The parlor is 27×24 feet. The carpet is of body Brussels of elegant make and extra quality. The same pattern extends through the reading and billiard-rooms. All the carpets were selected for the Club by Mr. Rogers, President of the Union Club of San Francisco, who has certainly displayed superior taste in the selections made. The mantle is of the finest Italian marble and adorned with beautiful bronze statuettes, the one in the center bearing an elegant clock, those at either hand representing Shakespeare and Tasso, respectively. Above the mantle is placed and elegant and costly French plate glass mirror. The walls are finished with China glaze and ornamented with distinguished works of art, and conspicuous among them were noticeable the two storm scenes by French, the one representing “Broad River Falls,” North Carolina, the other “Haymaking,” and each having a storm done to nature for a background. These elegant paintings were purchased at the recent art sale in this city. The windows are of fine plate glass and the furniture upholstered, the covering blending and harmonizing beautifully with the carpet. The chandeliers, both here in the parlor, are of elegant pattern, beautifully gilt and the finest ever brought to Virginia City. Large sliding doors connect this room with the parlor, as the two are fitted up en suite. The billiard-room is carpeted with the same body Brussels as the parlor and reading-room. It contains two elegant tables manufactured by Strahle & Co. with Delaney’s patent wire and rubber cushions and slate beds. Here everything is of the same style of elegance as prevails throughout the entire establishment. Even patent counters are introduced, thus doing away with the necessity of stretching wires across the room. This room is to the right as the upper hall is gained and communicates by sliding doors with the parlor. The wine and card-rooms are to the left of the upper hall and communicate with the reading-room. These are richly and tastefully furnished and contain everything which can contribute to the comfort and enjoyment of those who frequent them. These rooms are respectively 14×17 and 14×14 feet. The card-room is back of the library, and the wine and lunch-room in the rear of the card-room. The sideboard in the latter is of black walnut, elegantly and elaborately carved. Next to it is a sink of the same material and made to correspond therewith. The carpets in both rooms are of the same pattern and differ in figure only from those in the other rooms. The chandeliers in these rooms are most elegant and covered with steel plate, which is polished like silver. The store-room is on the lower floor, where all the supplies are kept. The whole is under the immediate supervision of the Assistant Secretary, W.C. Brown. All supplies are charged to him. When anything is needed by the bar-tender upstairs, it is charged to the sideboard. Members partaking thereof or engaging in billiards, hand to the bar-tender a card prepared for the purpose, which is filled out with the name, article and amount. No money is used by the members. Their accounts are all kept and charged up and kept with their monthly dues. It is the duty of the Assistant Secretary to keep all these accounts, as well as to attend to their collection. The Washoe Club opened its quarters for business on June 1, 1875, and according to reports in the press, applications for membership came in rapidly, but little did anyone realize that the Club was already at its zenith. Within less than five months the palatial club rooms were consumed by the flames that destroyed much of Virginia City on October 26, 1875, and members fell behind in paying assessments on their membership stock. Faced with the need to find a new home for the Club and the delinquency of assessment, officers of the Washoe Club ordered on December 10, 1875 that all delinquent shares be offered at public sale on February 10, 1876, on the site of Club rooms on “B” Street. Among the delinquent members were these prominent men in Nevada history: Rollin M. Daggett, editor of the Enterprise, attorney Charles DeLong, Dennis Driscoll, publisher of the Enterprise, U.S. Senator John P. Jones, J.H. Kinkead, who later became governor of Nevada; U.S. Senator William M. Stewart, and Henry M. Yerington, Virginia & Truckee Railroad magnate. . . .The Washoe Club rooms in the Douglas block are now nearly completed and more elegant than those on “B” Street which were consumed by the great conflagration of last October. They are also more conveniently located, being within easy access of both “C” and “B” Streets, and in the busiest part of the city. They comprise, in all, eight apartments, all of which are fitted up with elegance and taste. They are reached by a flight of stairs from “C” Street and also by steps from “B”. The following is a list of the officers of the Club: J.H. Kinkead, President; George A. King, Secretary and Treasurer; Trustees, C.E. DeLong, M.N. Stone, E.A. Schultz, S.T. Curtis, J.B. Overton, George H. King, John H. Kinkead, Henry Rolfe, E.B. Dorsey, Thomas H. Ralston and Jasper Babcock. There are over 100 active members of the Club. The reading-room fronts on C Street and is lighted by four large windows of French plate glass. The apartment is 30×22 feet. The floor is covered by an Axminster carpet of the thickest and finest make and most elegant pattern. In the center of the room is a 4 by 12 table of black walnut inlaid with laurel, on which are all the papers and periodicals usually read on the coast. The room is abundantly provided with upholstered furniture in the shape of easy chairs, sofas, lounges and the like. On each side are placed $800 mirrors of French plate glass in frames and mountings manufactured expressly for the porch of the building in front. In the evening the apartment is brilliantly lighted by two chandeliers of polished steel. The reading-room is separated by folding doors from the billiard-parlor. The billiard-parlor is in size its exact counterpart, so that when both rooms are thrown together an area of 22×60 feet is gained. It is lighted from the rear by day and by silvered chandeliers by night. The carpet of this parlor is of the same pattern as that of the reading room. It contains two Strahle tables of the very best make and latest improvements, the beds being of slate and the legs, etc., beautifully carved. Wilton carpets with mitred corners surround the tables. The markers are peculiar institutions and were manufactured expressly for the Washoes at a cost of $100 each. They consist of small black walnut stands, from the sides of which rise arms branching out about a yard. These are connected by wires on which are strung ivory buttons. The counting is done with the fingers and thus the unsightly and inconvenient wires across the room are avoided. A stationary washstand occupies one corner and the parlor is amply provided with furniture. This room communicates with the hall and main entrance and also with the wine-room. The wine-room is connected with the billiard parlor by means of a broad, arched doorway, richly and heavily draped with crimson curtains, which are drawn aside during the occupancy of the rooms. This room contains an elegant sideboard amply stocked with the very best beverages and cigars which can be procured and a lunch table bountifully supplied with delicacies and substantials. It is richly carpeted with body Brussels. This room is adjoined on the west by the card-room, which is carpeted like the wine-room and furnished with all the appliances which belong to such places. These apartments and the reading-room and billiard-parlor are daily thronged with the members of the Club and their guests. A stock-reporting telegraph gives regular quotations from the market, and its registerings are narrowly watched while points are given and exchanged among the members. Between the wine-room and the hall are the reception and storerooms. The former is conveniently arranged for the use of members and visitors. It is provided with hat-racks, and at one side are arranged a number of boxes for the reception, in stormy and bad weather, of mudshoes, etc. The store-room is provided with facilities for storing in proper order the supplies for the wine-room and such other things as are necessarily kept on hand for the convenience of the Club. Across the hall and reaching to the front of the building are two private card-rooms, which are also being prepared with the proper furniture and necessary accommodations for the members in this line. Taken all together, the rooms are more convenient, better arranged and more elegantly and luxuriously fitted up than were the rooms which were occupied by the Club previous to the fire. With the artist calls for four pictures, each to be thirty-six by fifty-six inches in the clear. They are to represent Virginia City from end to end, and are to be so faithfully executed that every place can be pointed out and recognized. This panoramic view of Virginia is to constitute the foreground of the pictures – the scenery in the distance the background. The characteristics of the place, the heavy wood and quartz teams, the miners with their buckets, and even the Chinamen with their pack-mules loaded with wood, are all left to be filled in truthfully, according to the taste and skill of the artist. The paintings were executed and a complete descriptions of them , as gleaned from art critics of the day, may be read in The Works of C.B. McClellan, compiled by Dave Basso and published in 1987 by Falcon Hill Press, Sparks, Nevada. 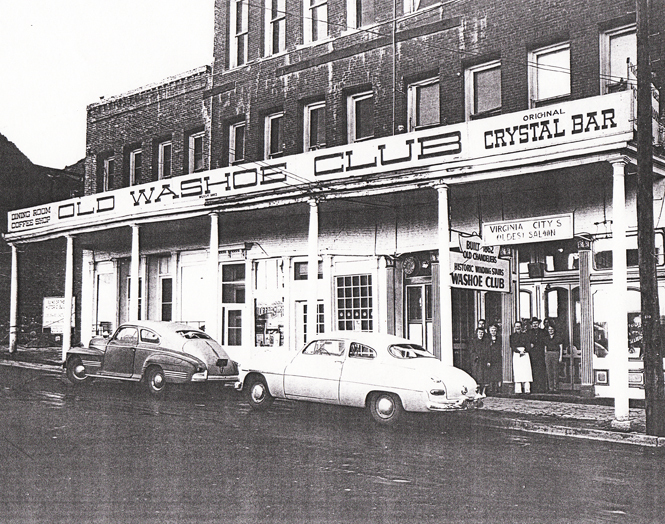 “The closing of the Washoe Club marks an era in the history of Nevada, as did its opening,” the paper concluded.